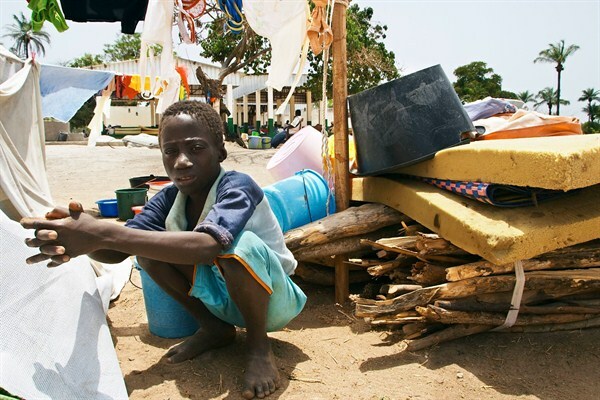 A Senegalese boy from the southern Casamance region waits by his family’s belongings at a camp for those displaced by fighting south of Ziguinchor, Senegal, April 7, 2006 (AP photo by Laurent Emmanuel). Early this year, as the world waited to see whether Gambia’s then-president, Yahya Jammeh, would accept his election defeat and leave office, observers questioned who could help him muster the firepower to mount a last stand. Though this debate turned out to be largely speculative, one of the most commonly cited possible reserves of support was the Movement of Democratic Forces of Casamance (MFDC), an insurgent group that has been active in southern Senegal for more than three decades.